Happy World Pangolin Day! Here is an illustrated map that shows where to find the 8 extant species of pangolins in the world, and also denotes their current status on the IUCN Red List (Range references are from the IUCN Red List). Pangolins or scaly ant-eaters are an order of mammals spread across Africa, South and South-East Asia. They are famous for rolling into spiny balls to escape predators, which is how they get their name ('Penguling' in Malay means something that rolls up- see cartoon on the pangolin's defence mechanism here.) While they use their keratinous scales for defence, pangolins are equipped with thick, strong fore claws, which they use to rip open termite mounds and ant nests. They then forage on these insects using their incredibly long tongues. In spite of being the most harmless creatures, they are the world's most trafficked mammals today, and some of the species are nearly extinct in the wild. The Asian species are poached heavily for their scales and meat (despite having been scientifically proven to have no medicinal value at all), while the African species are hunted as bushmeat. Read along to find out more about each of these adorable pine-cones! The Indian Pangolin is found across most of the Indian sub-continent. 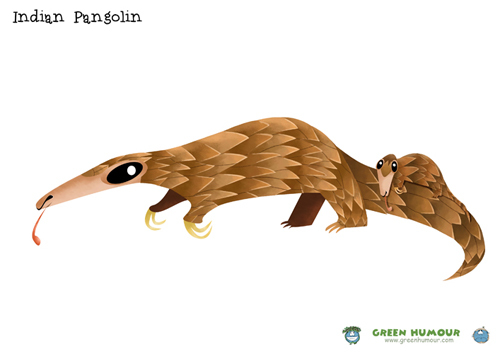 Pangolin pups often piggy-back on their mothers' tails as shown in this illustration. The Indian Pangolin is endangered and is one of the most trafficked pangolins. The Chinese Pangolin is one of the world's rarest pangolins. It is identified by a visible external ear. Its range extends from North-East India to Southern China and Indo-China. It is critically endangered. The Sunda Pangolin occurs through South-East Asia in forests and plantations. 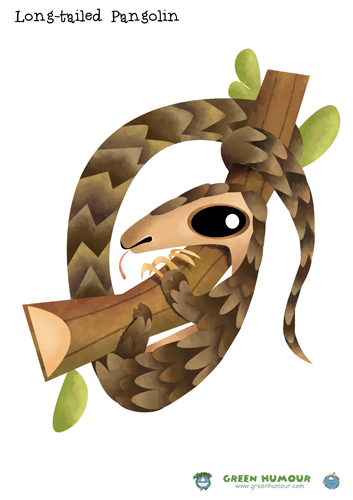 It is an arboreal pangolin, spending most of its time on trees. It is listed as critically endangered. Also called the Balintong, the Philippine Pangolin is endemic to the Palawan province of the Philippines. This species too prefers trees over land. It is listed as endangered. The Tree Pangolin is an African species of pangolin found in equatorial forests. As the name suggests, it is an arboreal animal, and is the most common among forest pangolins in Africa. It is listed as vulnerable. 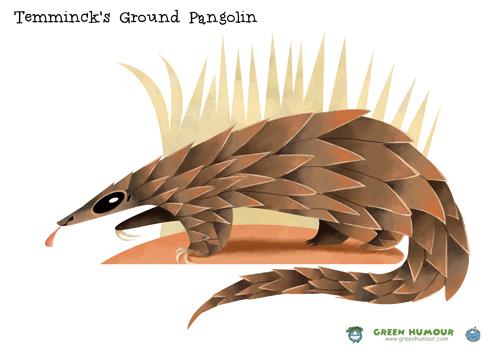 The Ground Pangolin is the only species found in eastern and southern Africa, and inhabits scrubs and savannas. It is a terrestrial species, and is 'vulnerable' on the Red List. The largest of all pangolins, the Giant Pangolin occurs in equatorial Africa. It possesses the ability to walk upright, using its tail for balance. It is listed as vulnerable. The Long-tailed Pangolin is an arboreal forest pangolin found in equatorial Africa, and is the smallest of all extant pangolins. 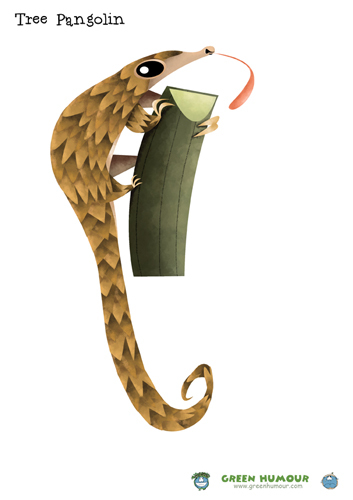 The long-tail is prehensile, and aids the pangolins arboreal lifestyle. 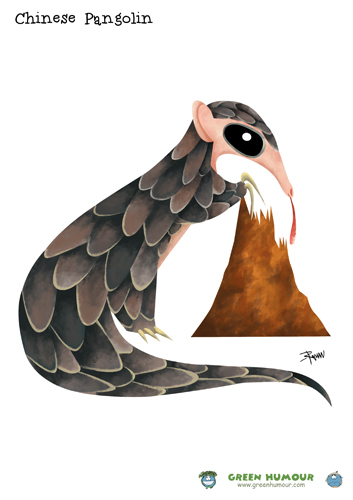 The Long-tailed Pangolin is vulnerable owing to hunting for bushmeat, and deforestation.